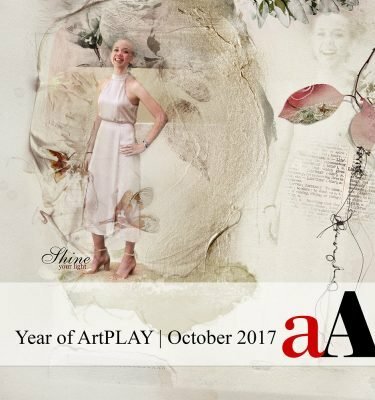 ArtsyDoubles is a workshop, delivered in 4 LIVE sessions in February-March 2019, designed to teach the approaches, techniques and principles behind creating your digital artistry and scrapbooking layouts in cohesive double page format. This workshop is SO MUCH more than creating Artsy Double Page Spreads. How to design pages using key design principles. Tried and tested techniques behind cohesive artsy design. All the secret tips and tricks to using aA DigitalART products with ease. Create single OR double pages that you absolutely LOVE. 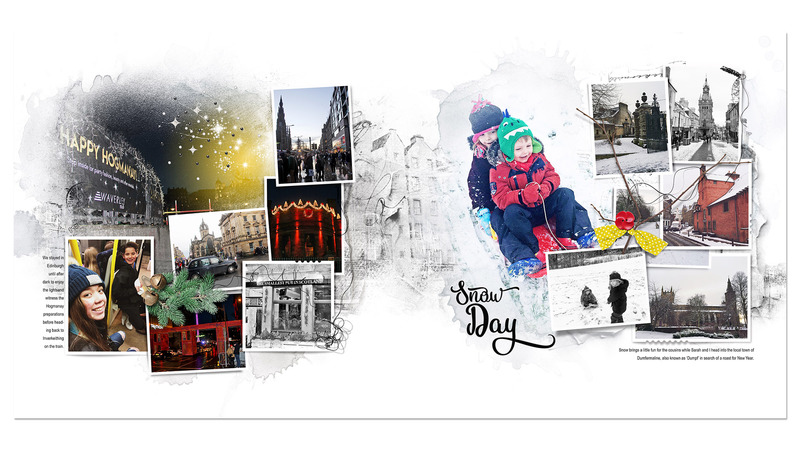 Change the way to create your digital scrapbooking and artistry. Some students of this course have been able to elevate their artistry almost overnight. ArtsyDoubles is now available as a self-pace course. Edited REPLAYS of this 4 part LIVE event are now available for immediate download. One session leads to another in a step-by-step process. Establishes higher skill levels and builds confidence so you can create digital artistry/artsy digital scrapbooking pages in MANY different ways. 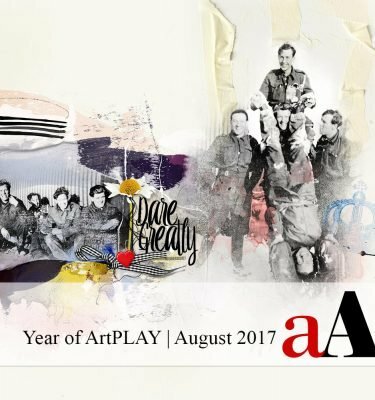 Understand the foundations of digital artistry/artsy digital scrapbooking and how single and double page format changes your approach. 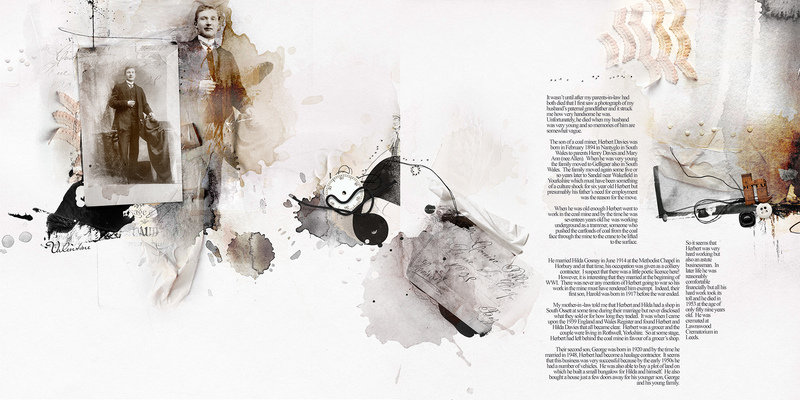 What you need to know about ‘Artsy Double’ page spreads. Breaking down the concepts of Basic Layout Design, Components and Element Properties. Master the TOP 5 Artsy Design Principles of Hierarchy, Proximity, Alignment, Contrast and Balance. Simplify the ‘Layers’ of a Layout and establish a process that works for you. Understand how the Rule of Thirds changes for Double pages. Step-by-step guidance for creating Single and Double pages. Use Guides to help you design your artsy layouts. Introduction to the Master ‘Blueprint’ Template with MORE THAN 64 Layout Design Options. All the secrets behind the game-changing aA ‘Diagonal Tension’ principle. Multiple layout examples to support session content. 11 videos in .MP4 format ranging from 3 mins – 15 mins for a total of 1 hour and 18 minutes. 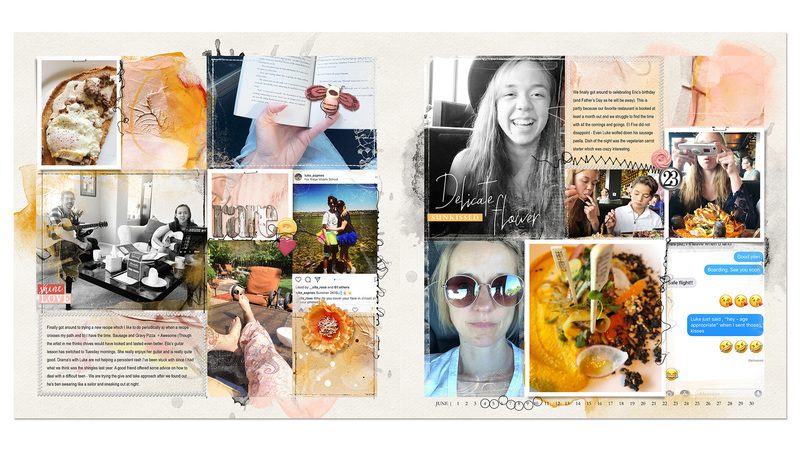 Learn how to mix and match a variety of templates (Album, Artsy and FotoInpired) to create new Double Page spreads, and coordinating layouts to existing Single pages. Understand the 3 different types of Artsy Template. How Artsy Templates differ from traditional digital templates. 7 Step Process to creating a Double Page using Templates. 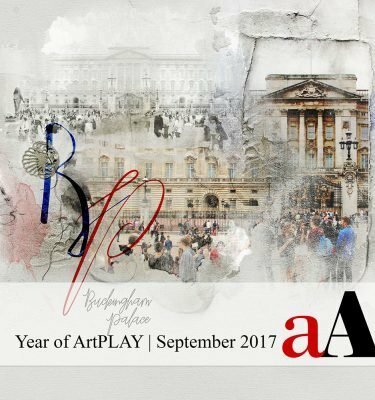 Guidance for creating layout Foundations and selecting different Artsy Templates. Modify/Partial Template usage to establish Double Page Foundations. Mixing and matching Template styles according to Design Principles. Identify and create Focal Points in your layouts. Use the Master ‘Blueprint’ Template Layout Designs Options with Templates. Using ArtPlay Palette components to support chosen Template design. 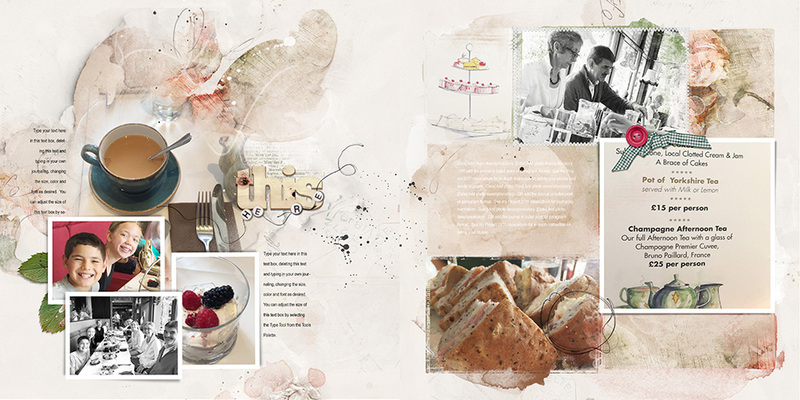 Create Cohesion using Templates and DigitalART supplies across 2 pages. Considerations for adding Embellishment to your layouts. 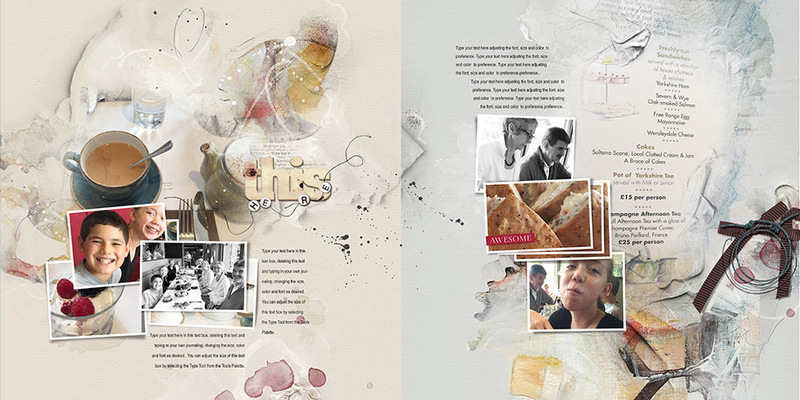 Create an adjoining layout to transition from a Single to a Double Page. 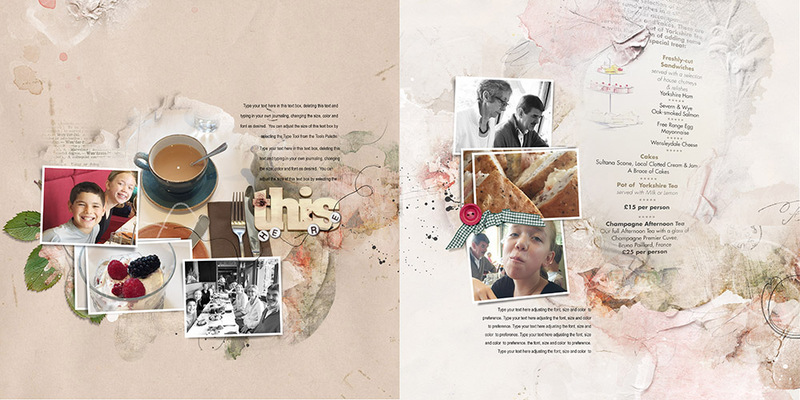 Multiple layout examples with alternate Template and DigitalART supply combinations. A variety of modern everyday, travel and heritage layout examples. 9 videos in .MP4 format ranging from 2 mins – 18 mins for a total of 1 hour and 14 minutes. 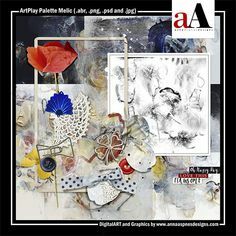 Focus on creating a double page spread using Artsy Papers and coordinating ArtPlay Palette and ArtsyTransfers DigitalART supplies. The difference between Transfers/Overlays in ArtPlay Palettes and ArtsyTransfers. 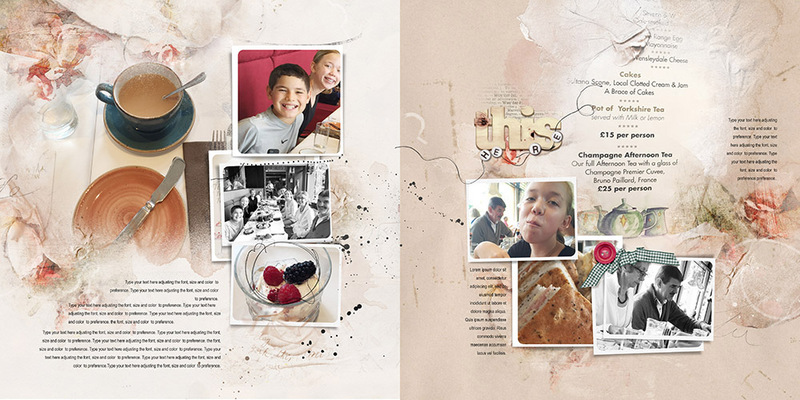 Use ArtsyTransfers and ArtPlay Palette components to create balanced Double Page spreads. Modified 7 Step Process to creating a Double Page using Artsy Papers. 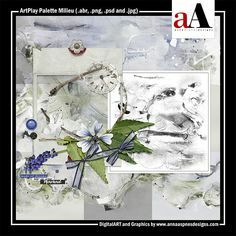 How to select an Artsy Paper and create a coordinating Custom Artsy Paper using DigitalART supplies. Use Master ‘Blueprint’ Template to guide Layout Foundation and establish Focal Points. Blend your photos with FotoBlendz Clipping Masks. Add supporting elements and photos to according to artsy Design Principles. Create Cohesion with a variety of DigitalART supplies according to the ‘Layers’ of a Layout. Incorporate Artsy Template components with Artsy Papers. Multiple layout examples with alternate DigitalART combinations. Create an adjoining layout to transition a Single Layout to a Double Page. 8 videos in .MP4 format ranging from 3 mins – 14 mins for a total of 58 minutes. Master the art of creating Double Pages spreads from blank canvas using everything you have learned in the previous 3 sessions. Starting a layout ‘from scratch’. Use Master ‘Blueprint’ Template to guide layout design. 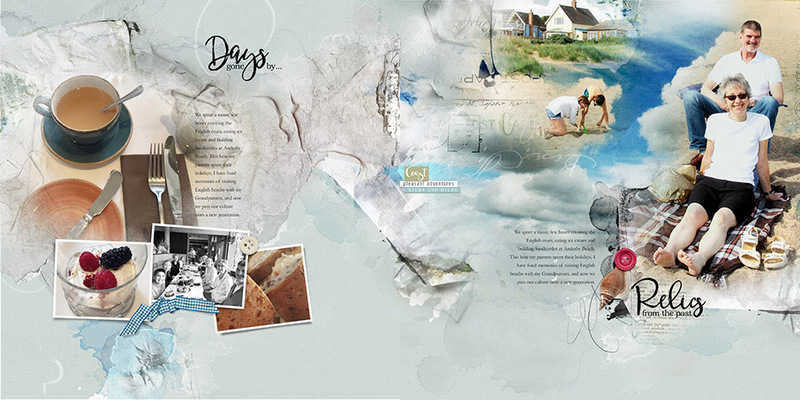 Modified 7 Step Process to creating a Double Page using a variety of DigitalART supplies. Recommended approaches to creating a winning layout Foundations and establishing key Focal Points. 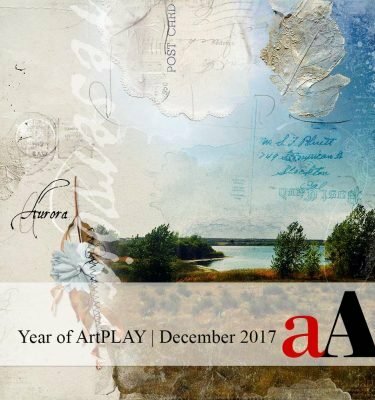 How to choose an ArtPlay Palette to support your layout design. Pre-selecting photos for your digital artistry/scrapbooking pages. Incorporate techniques and principles from Sessions #1-3. Apply Hierarchy Principle to create Cohesion with Elements in your designs. Make White Space work for you. Multiple layout examples combining Templates, Artsy Paper and FreeStyle techniques. Insight into my personal Heritage Project. 10 videos in .MP4 format ranging from 3 mins – 14 mins for a total of 1 hour and 7 minutes. 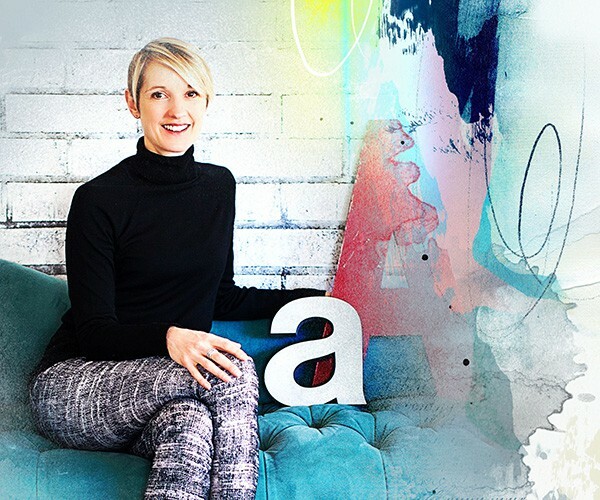 This class is designed for ANYONE who want to master the art of digital design using Anna Aspnes Designs. 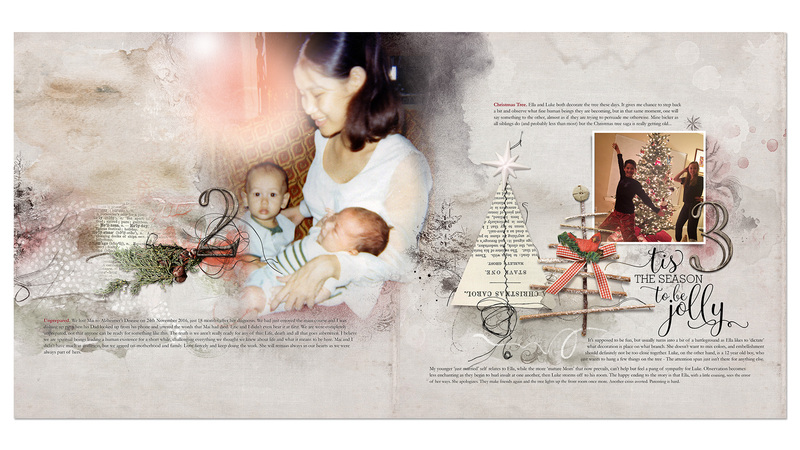 It’s a comprehensive design class recommended for Novice to Advanced Digital Artists, Scrapbookers, Memory Keepers, Photographers and Ancestry Enthusiasts wanting to create digital pages for photo books and albums. Proven approaches and techniques for creating balanced Single and Double pages. Step-by-step ‘recipes’ for you to follow in creating your layouts. Options for customization to support your own preferences and process. 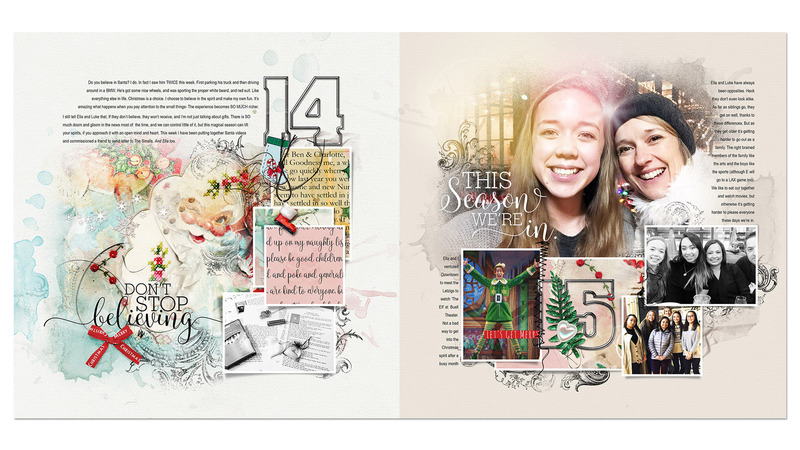 Increase your confidence in creating your digital artistry and scrapbooking projects. Enrich your creative process and elevate your artistry. Master the art of artsy digital design in just 4 hours. Supporting detailed .pdf handout and additional DigitalART as outlined in each session. Guidance for Photoshop Elements Users will be provided where appropriate. This course is LESS about the program you use and MORE about making the artistry happen. See the glowing REVIEWS above from students who have taken and LOVED this course. This class really has resonated with me. I finally got to watch session 3 in it’s entirety last night. I feel like I will be able to use the artsy papers, transfers, and overlays with more confidence to build my pages. My brain is a very square, black and white box. So artsy is not something I do well. Putting all of the steps together like Anna has shown and coming out with such a wonderful page in the end is awesome. Somehow it is so much clearer to me after watching the processes. The unedited version was so helpful, since I missed so much of the live portion. Having said that, the edited ones are tremendously helpful as I can go back and look at smaller bits at a time and be able to soak it in a little slower. I am loving the class, the way it is presented, the artsy supplies to practice with, the supporting pdf class outlines, the videos that use demonstrations of how the different artsy products build on each other. All of the examples and the different steps make it so clear how I too can accomplish beautiful results. One of the best things also is building double pages makes the process go almost twice as fast because I end up with 2 pages instead of only one and they fit together beautifully. Anna spends a great deal of time and effort to make the classes awesome! There are a plethora of ideas to mix and match the different pieces to build unlimited choices in my layouts. Thank you Anna for sharing your expertise. I’m so happy to hear this Terri. I have observed you grow with just pure joy over the past few years. Everyone has a little artsy in their linear and I’m happy that I have been able to coax it out of you. I so appreciate your time in leaving such a detailed review. Big thank you from the bottom of my heart. Until I created my first photobook, I didn’t see the need for double pages. Now I want to know how to be more creative so as to improve my photobooks. I have found that family and friends enjoy looking at my art when they can peruse a book. In this class Anna start sout with templates like we use in the end of year Projects and move into creating our pages from scrap. I know I will refer to the edited videos and PDFs often. Thank you for all your wonderful classes. Anna. Thank YOU so much Joan for entrusting me to be your guide in your digital artistry adventure. The name of this class “threw me off” and at first I thought I didn’t “need” to take it, since I’ve enrolled and followed Anna’s Project December classes for the last 3 years, creating double pages. However! This class is soooo much more than creating cohesive double pages. Anna intricately breaks down the processes, the terminology, and the supplies, giving details that will greatly benefit our/your creativity. As I watched each of the sessions, I gathered wonderful tips for the double pages, as well as noticing how they will also apply to my singles pages. This all made me very excited….it was like starting all over again and learning that Artsy Pages could be made from my photos. I know I will be referring back to these videos numerous times, to strengthen my skills, give me a better “eye” for a layout (both single and double page), and give me more confidence in my own creative style and making better choices using Anna’s Digital Art Supplies. This class will elevate your confidence, and your creativity. And, 5 stars x 2 will cover my rating (10). I’m so happy I signed up for this class. Thank you so very much Anna! Wow! What an amazing review. Thank you Beverly. I came to the same conclusion as I was writing this course…It is SO MUCH MORE. Thank you for being part of the experience and taking the time to share it here. You certainly get your money’s worth with Anna’s ArtsyDoubles class…so many downloads! It’s brimming with design guidance, supplies, and user-friendly tools like a Master Blueprint. I would highly recommend it for all…from the beginner to the advanced student. Anna breaks down the anatomy of a double spread in the first session and by session four, you’re free-styling your way to success! She sheds light on design concepts like tension, proximity, hierarchy, and alignment…and deconstructs layouts on the screen so you can SEE how they all work together for a cohesive result. Thank you for such a glowing review Marnie. Your time and talents are greatly appreciated. 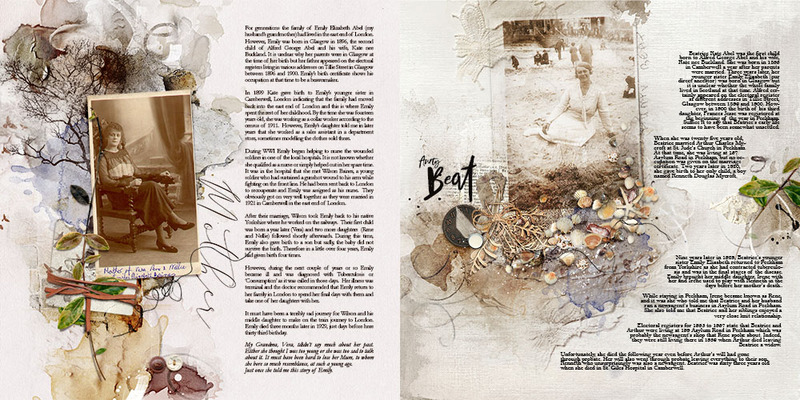 If you want to have flowing two page layouts, I highly recommend Anna’s Artsy Double class. Anna will teach you design basics about page designs, both double and single pages. Watching her process is a great way to visualize her unique technique, and a video is supplied so you can watch it over, which I like to do! I also really liked receiving her master blue print double layout page that Anna supplies with the class. Anna also includes her artsy products so you can practice her technique. I always learn new tools to make more interesting pages from Anna’s classes. I highly recommend the Blending Bundle classes also, which includes twelve sessions of classes. Thank you, Anna, for sharing you talents, your classes are definitely worth taking and I hope to participate in more! I maybe missed the mark here. You’re right! This class is SO MUCH MORE than double pages but teaches a solid foundation in artsy digital design. So glad you enjoyed the class as well as the aA Blending Bundle. BIG thank you for sharing your experience here. This class was exactly what I needed and Anna’s best one yet. I’ve been creating double page spreads for my albums for about a year now but have struggled with a few aspects of balancing the two pages. I also have rarely used Anna’s artsy layered templates which I often buy with her store releases. This class not only gave me the confidence to use some of these templates more often but also gave me the steps to make the whole double page work together in a cohesive way. Watching Anna’s layouts and how she builds the page following her steps that are tried and true has really helped me and I have a lot more confidence now in balancing my double page spreads. 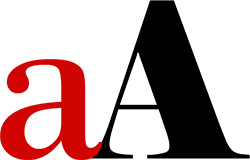 I most definitely recommend this course – the content and delivery are easy to follow and most inspiring. The included pdf files with the class content as well as feedback from Anna and the recorded sessions to watch back over and over are so valuable as well as the live events which I also love. I worked with you for a year in Club Critique but I have since so much progress in your pages since taking this course. It was an overnight transition. Thank you from the bottom of my heart for trusting in me to guide you. I’m so happy to watch you learn and grow as an artist. Again Anna, you never fail to exceed my expectations. 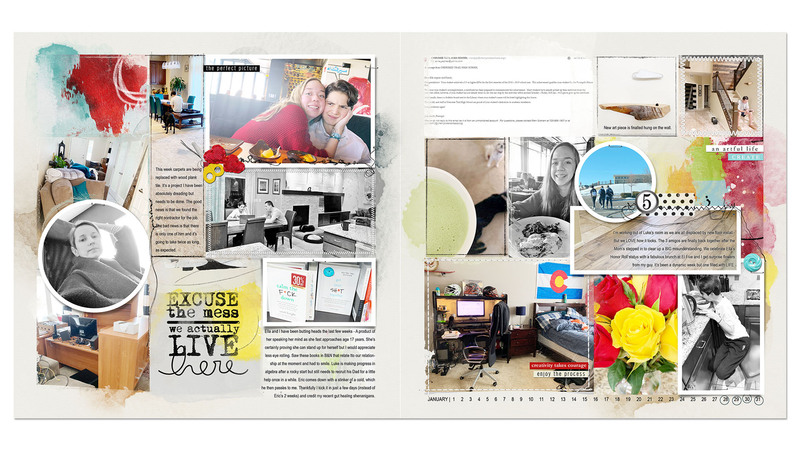 I think of scrapbooking as a toolbox, and having the right techniques in my toolbox allows me to pick and choose and make the best pages I am capable of. The master blueprint was a new challenge for me, and understanding focal points will help in positioning my photos for the my best visual composition. I look forward to making many double pages in the future. This is a wonderfully prepared class with visual instruction, prepared written notes, a lot of valuable digital product and Anna’s knowledgeable support. 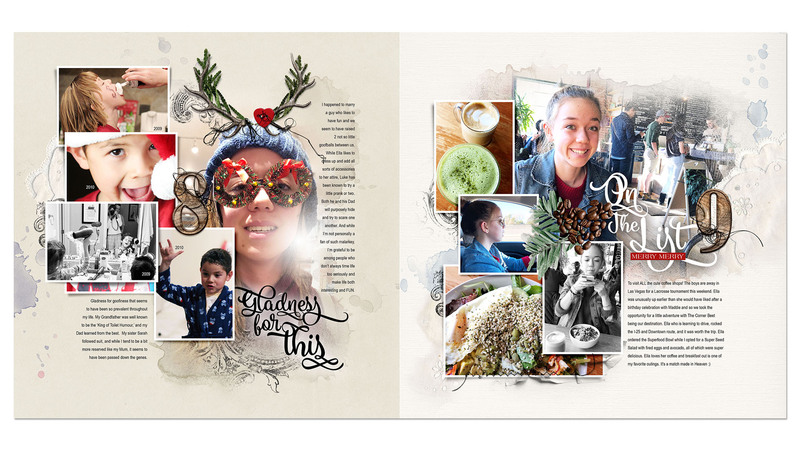 This class is of great benefit to both paper and or digital scrapbookers no matter what their experience as well as those who like to play with digital artistry. Anna shares lots of tips and tricks. It is fun to see her process and learn from her years of experience. I enjoyed the class very much and was happy to be reminded that there is always something new to learn. I’m so happy to hear this Kim. Thank you for the lovely review and thrilled to have been able to inspire you. What an amazing class. Anna presents in a very easy way, how to create a cohesive double page layout. She has answered so many questions I have had and I now feel so much more confident to go ahead with the Artsy technique. Definitely recommend this class. Thank you for the lovely words. So happy to have been able to make a different to you. I typically create double page spreads, I feel I get much more accomplished working on both pages at once, especially when I have so many pictures to work with. While creating them I never gave much thought to the design principles to be thinking about to make my pages flow, until now. *How to- The Master Blueprint Template – is a masterpiece in itself! I have more confidence now in creating these 2 page spreads! Thank you Anna for all that you do to help us create our masterpieces! And it shows Peggy! You are a rock star. Thank you for the kind words. I have been working with Anna Aspnes classes and products for a couple of years. This class is amazing! I take photos and use the rule of thirds but never thought to apply it to the digital pages. The master template is genius. A quick way to make an artsy layout. I have not used the artsy templates much but after session 2, I know how to make use of them. The step by step process helps when I actually sit down to practice. I have wanted to graduate to double pages after working on a couple Project classes. This is a well construsted class and I will be using they new tools forever. Anna always does a fantastic job of teaching the class. It is a perfect addtIon to my collection of classes – Thanks Anna! Love that you loved it Karen. Thanks for sharing your feedback. 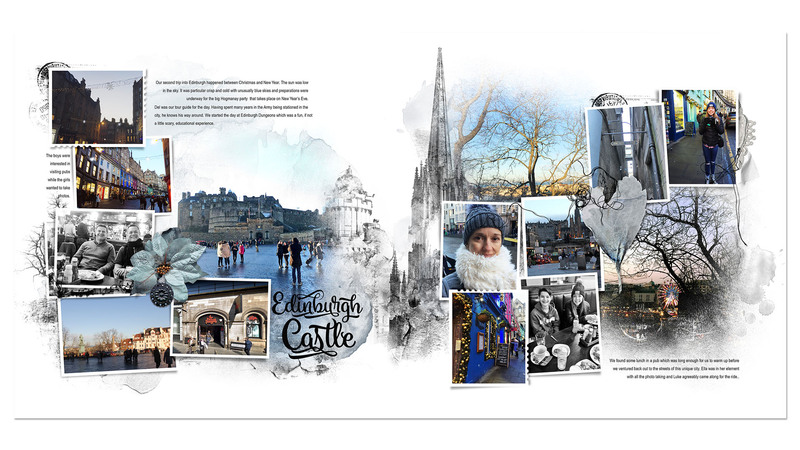 I signed up for this class because I tend to create printed albums based on my travels and they are, by nature, double page spreads. I thought I could pick up some new techniques and hints. Surprise, this course was beyond amazing and so much more than the coordination of two pages. This is a core learning class that teaches from the ground up how to produce two amazing art projects that balance and lift each other. From using the provided multi-flexible templates to standing on one’s one from start to finish, the course provides step by step instruction and lets your creativity fly. I highly recommend this class for anyone wanting to grow their skills. Thank you so much Jeanne. So happy you enjoyed the class. Looking forward to watching your artistry continue to grow. This ArtsyDoubles class is one of my all time favorites! I have taken many of Anna’s classes and learn so much with each one. I am very happy that I decided to take this class, after hesitating at first that I might not “need” it. The class is so elevated, upbeat, and filled with inspiration, techniques and design. The Mater Blueprint Template is fabulous, and the supplies always a fun bonus. Anna’s explanation and guidance is thorough and inspiring to create “Artsy Doubles”. 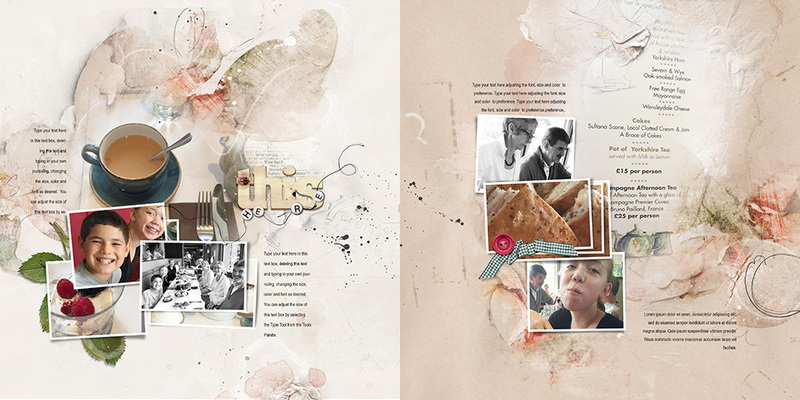 It even transformed to help me in creating some double paper scrapbook pages that went together quickly and look great. Having the video replays is wonderful for review and to refresh the memory. Anna you go the extra mile in breaking the classes down into segments. Thank you for all you give. Im a digital scrapper, and like to use a variety of styles in my layouts – this was the best class ever to help me think about using Anna’s products but also other designer’s products, and building 2 page spreads as I alway have more than enough pix to justify a double layout or photo book and it is my preferred format. So much useful info here – I have a number of Anna’s classes and this is one one of the best for creating pages. I would love to give it 5 stars but I found downloading 10 or 12 files for each session to be awkward and time consuming – had to keep doubling back to make sure nothing was missed. That being said, now with everything safely downloaded, I am already and will be returning to these files very often. This class and Anna’s brush class are indispensable for me. This class was fantastic. I’ve been waiting for years for someone to take the mystery out of planning and printing digital double page spreads. Awesome. Thanks for the feedback Carol. I cannot thank Anna enough for her generosity in sharing her process, knowledge and supplies for this course. I enjoyed immensely being taken outside my comfort zone in an attempt to create artwork like Anna’s that I admire so much. I have signed up for another course and will get started on that one shortly. I particularly like the fact that although I couldn’t get up early enough for one session it was there waiting for me to do in my own time. Anna explains everything at a pace that is easy to follow without being tediously slow. The course is well organised and structured and the many examples given were broken down to show how they were constructed and why, which is so important. It was also interesting to see that other people had the same questions that I had. This class is exactly what I needed as I nearly always do double pages and the artsy templates I have were single pages so I was glad to find out how to use them in a coordinating double layout. I now have the confidence to start with a blank page and create a double page from the ‘ground up’. So exciting- I can’t wait to create more! Thrilled you enjoyed the course and thank you so much for taking the time to leave such a detailed review. Appreciate you! This is one of the best classes I’ve ever taken! I debated about it, after taking HeritageLive, but I’ve learned SO much—and I haven’t even done Session 4 yet. I could not take the class live, so I’ve been slowly doing the sessions on my own. Since both of these, I’ve created 13 pages and feel more confident with each. I’m working on a heritage book, so most of them fit into that category. I had not ventured far into the Artsy realm until now, even though I’ve been digi-scrapping for years and stalked aA Designs. I’m extremely linear in my style, so it’s been a stretch to learn to use masks, stains, transfers, clipping, etc. But I love the results! Anna provides such wonderful examples and walks us through, step-by-step, with the videos. The supplies provided to the class only make me want more—i.e., entire ArtPlayPalettes instead of just a snip. One more thing: she is also very responsive to any questions and provides constructive criticism and encouragement. These classes really spark my creativity, making me itch to create more pages. Each technique or product or example inspires me with a new idea for sharing photos and stories. But a word of warning: they are ADDICTIVE! Just one slight criticism: I like that the various components for download are broken out into smaller increments, but I occasionally have trouble identifying which I’ve done and have frequently double-downloaded. This is especially true with the corrected/edited versions—the names as shown on my account page are not always consistent with the names after download or on the videos themselves. Thank you, Anna, for sharing your incredible talents and skills with us! And thank you for being so enthusiastic about my classes. I appreciate your time in sharing your feedback. This is a really great course by it’s self. Much more than I thought it would be and no need saying the mega pack is awesome and makes the course more than free . Anna is right there to help too if you get stuck which I do on occasion. You are wonderful Nancy! Thank you for the kind review and yes, I stand by my word, I am happy help always. ArtsyDoubles is definitely the best class I have taken for album work to date. I have created double page layouts for awhile now and have had problems keeping them cohesive. This class pulls it all together. I loved that the demos included templates, papers and freestyling, There are always new techniques in Anna’s classes and her suggestions and critiques are honest and helpful. Being able to download the class videos, watch over and over while working at my own pace is extremely useful. The master blueprint, pdf’s and supplies included are an added bonus. I highly recommend this class to all. Thank you for your time Anna, and look forward to your next class. Thank you always for entrusting in me t be your guide 🙂 So happy you enjoyed this class and you are pleased with the results. 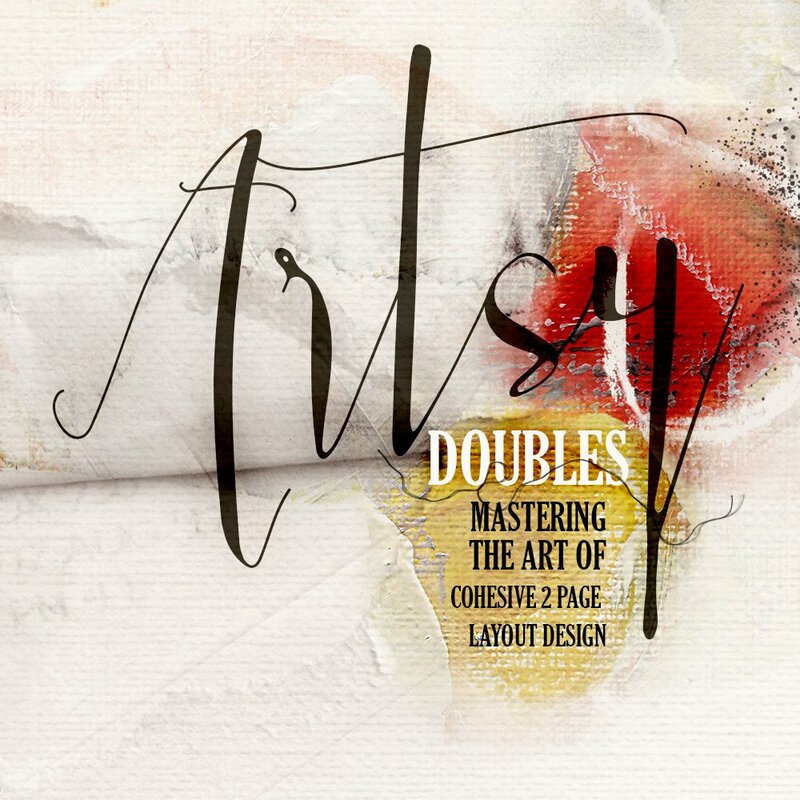 Artsy Doubles Class. Even though I’m a hybrid scrapper and don’t do digital photo books, you thought I’d like this and I did. Like your other courses it’s full of tips and techniques for single page layouts which I will use – if I can remember them all from the videos. I really appreciate your list and definition of design principles. Even though I don’t think I’ll be using them, I am really impressed with your Master Blueprint Template for double pages and I’ll certainly be referring to your pdf files for this class. The Master Blueprint Template is a wonderful tool and I plan to refer to it for ideas. This is a great class for single and double page scrappers. Your classes are very clear and concise (great diction!) which I really appreciate. Also, thank you so much for all the supplies you include in your classes. So happy you enjoyed the class Suzie.